Small-town girl Katie Fisher is planning her wedding. Sure, her boyfriend hasn't managed to pop the question just yet, but that doesn't mean she shouldn't enter a contest in "Texas Bride" magazine to win the dress of her dreams, right? But when her boyfriend breaks up with her and takes a job in another town--the very same day Katie wins her dream dress--her world is turned upside down. Should she claim her prize? And will the hunky former pro-basketball player who runs the swanky Dallas bridal shop--yeah, you read that right--catch on to her humiliation if she does? 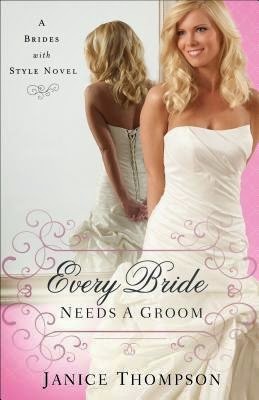 Janice Thompson writes the sweetest love stories and Every Bride Needs a Groom is no exception. While the story itself was fairly predictable, I still enjoyed the characters and how every one of them had their own smaller story within the main story. Katie was sweet and honest to the bone, her family so incredibly small town that it was a bit like being back where I grew up, and those big city folks? Well, they're a whole bundle of fun all in themselves. The book moves at a quick pace, but not so quick that you feel as if you've been left behind. I especially appreciated the epilogue and how the book ended. I can't tell you why though. You're just going to have to read it yourself to find out.